West 8 received both a nomination and a special mention in the 2018 edition of the Architizer A+ Awards. The New Hondsbossche Dunes project was shortlisted in the Architecture + Landscape category, and in the Outdoor Furniture category West 8 received a special mention for the Irma Logs. 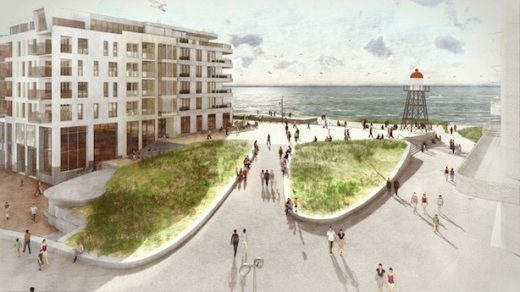 For the sustainable transformation of a seawall into a dynamic and robust dunescape, our New Hondsbossche Dunes project was nominated as one of five finalists in the Architecture + Landscape category. The artificially created dunes stretching roughly 8 km along the Dutch coastline are in the race for both the Popular Choice Award and the Jury Award. To make your opinion count, you can cast your vote here. Public Voting ends on Friday July 20th and the winners of both the Archtizer A+ Jury Awards and Public Choice Awards will be announced July 30th. The nomination of this project is not the only accomplishment for West 8 in the award this year. Our benches and art pieces by the name Irma Logs have been honoured by the award committee with a special mention. Irma Logs are made from debris that was left behind by Hurricane Irma. First exhibited and sold at Design Miami in December 2017, a part of the revenue was donated to hurricane relief efforts. According to the jury, the special mention honours the most remarkable achievement amongst the top 5% of submissions. To learn more about the above mentioned projects, you can visit the project pages of The New Hondsbossche Dunes and the Irma Logs. On the 18th of October, 2018, Adriaan Geuze will speak at the Designing Water Conference in Longwood Gardens. Ballast Nedam Development annouced the materialisation of West 8’s master plan for the real estate part of De Groene Loper (The Green Carpet) in phases. On 27 June, Maarten van de Voorde, Director of West 8Belgium was invited to lead a tour for the client group and stakeholders of the Parc du Moulon et le Carré des Sciences project in Saclay after delivery of Phase 1 of the project. 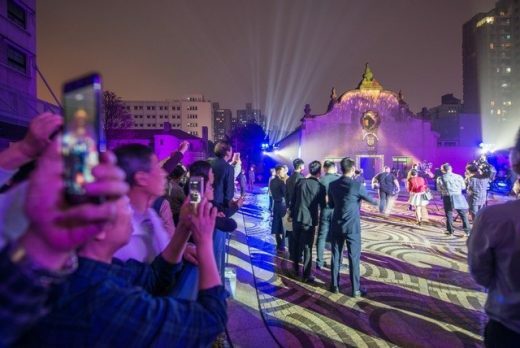 Opening of 4.7 hectare site with a strong architectural legacy and is poised to again become one of Shanghai’s most prominent public spaces. ‘All About Housing’ is the theme of the Kaliningrad Forum for ‘Living Environment’. Toegther with other speakers, West 8 Partner and urban designer Martin Biewenga presented on May 18 West 8’s current Dom Sovetov Square project at Kaliningrad. The delivery of the City Square in 2016 has brought the Rio Cali Park phase 2 forward. It broke ground in spring 2017, moving forward with construction of the western stretch of Río Cali Park. After transferring 80% of the original A2-line high-speed traffic underground, the 2 kilometers long part of Groene Loper between Geusselt and Europaplein was finally completed and opened to the public on 13 June. Consortium Ballast will help to elaborate and build West 8’s design of bridge over Wilhelminakanaal at Moorland, Oirschot City, construction will start in the third season of 2018. 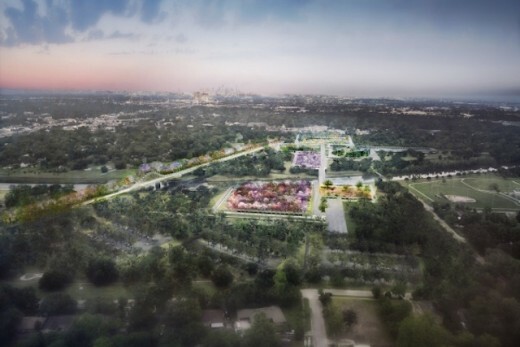 West 8’s plans for Phase One of Houston Botanic Garden, called “Botanic Beginnings” have been unveiled. 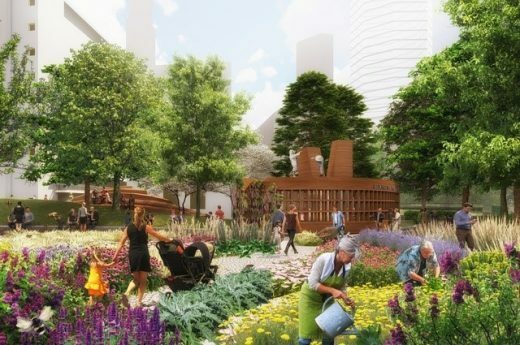 Set to open to the public in fall 2020, the 120-acres of botanic gardens will welcome Houstonians from all walks of life. The design for the reinforcement of the Afsluitdijk has been presented to the media. West 8 is the Landscape Architect of Levvel’s Design Team. The construction of ‘t Zand Square in Bruges is advancing swiftly. On Sunday the 6th of May, the site was temporarily opened to the public, providing a glimpse of the future appearance of the square. On April 18, the most recent plan for the improvement of Zernike Campus Groningen was revealed. The bike and pedestrian friendly design builds upon West 8’s master plan originated from 1999. 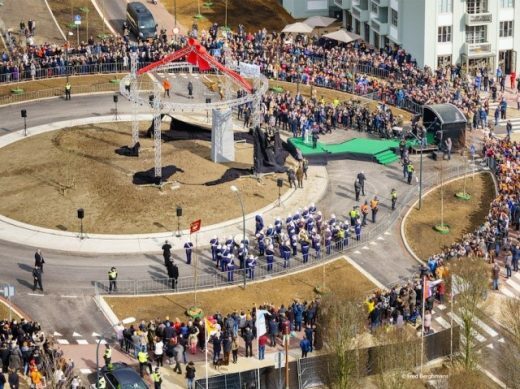 During the opening event, the king unveiled ‘The New Angel of Maastricht’, a statue by artist Wil van der Laan, located on the roundabout Scharnerweg and rising seven meters high. The surrounding area has already changed drastically and will undergo a further metamorphosis in the coming years, with the Groene Loper being completed and over a thousand new homes being built. In 2016 the tunnel construction was completed. The overground construction of The Green Carpet is still in full swing. The carpet extends over a length of 2.3 kilometers and is designed as a ‘promenade plantée’, ranging in width between 45 to 120 meters. Lime trees in up to eight rows ensure a generous and monumental character. A six meter wide path in the middle gives way to plenty of space for pedestrians, cyclists and runners. Street furniture, such as lampposts and benches, was also designed by West 8. 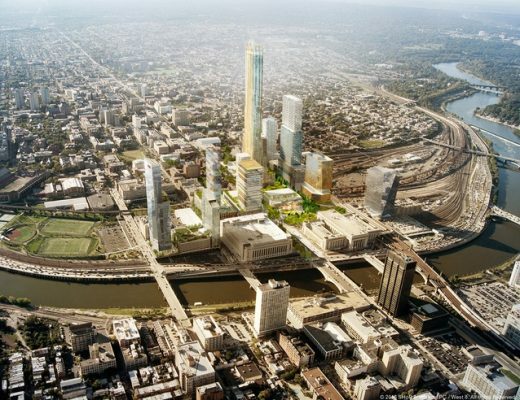 The stacking of the tunnel has created space for urban developments on both sides of The Green Carpet. Over the coming years, more than a thousand homes will be built in a great variety, both in terms of both typology and form. For the urban master plan, West 8 was inspired by Maastricht´s canals, with their high diversity of mostly 19th century buildings. Today, a new book and a documentary about the undertunneling of the A2 and the construction of the Green Carpet were also published. Edzo Bindels gave an interview for both editions. A2 Maastricht Model book by author John Cüster. The project team of Longwood Gardens Main Fountain has just been awarded one of the Philadelphia Preservation Alliance’s 2018 Preservation Grand Jury Awards. Earlier in March the project team was also announced winner of 17th Palladio Award. 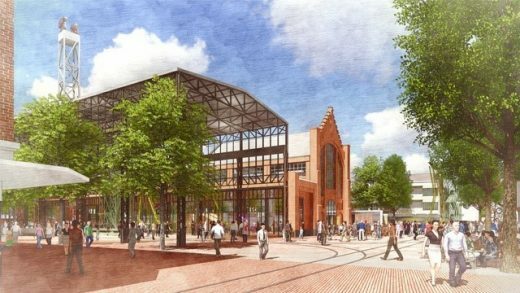 On December 8, Bureau Hengelo announced that West 8 has won the design competition for the Hengelo market square. With a majority of 68% of the votes, the public opted for West 8’s design, disqualifying the two other competitors Mecanoo and IAA Architecten. All Hengelo citizens of 8 years and older were allowed to vote this week for their favorite plan. West 8’s design meets the need of making the large sized market square more intimate and pleasant. To reduce the vast space, the design proposes a rebuilding of the old Stork Hijsch-buildings, which will serve as a cultural market hall. These buildings once belonged to machine manufacturer Stork, a company that settled in Hengelo in 1856 and has been of great importance for the development of the city. The halls were demolished in 2015 after much debate. Their reconstruction increases the visibilty of Hengelo’s technological heritage. The multifunctional market hall allows for a cultural programming of events, exhibitions and restaurants. It features a series of mechanically moving animal sculptures. Like a parade, they can move through the city center along a marked route. A custom pavement pattern makes Hengelo’s past more visible in a playful and contemporary way. In addition to reducing the space on the square and adding a cultural program, the design introduces other elements to create a more attractive atmosphere. The Brink and Molenstraat will become greener with more trees and grass. The edges of the market square offer space for terraces and the weekly market. Together with warm colored pavement, new trees and a fountain, the entire area will have a more intimate character. The Hengelo bears, a sculpture group of artist Marjolijn Mandersloot, will move to the Brink Tower. In the coming period West 8 will further develop the plan together with local associations, institutions and residents of Hengelo. The construction of Shanghai’s Xinhua Waterfront Park, designed by West 8 in collaboration with Tongji University, has reached an important milestone. The concrete ‘alcove’ is now securely in place. Continuing with the planting of mature trees, soft landscaping and natural stone paving, the project moves forward fairly quickly. This 17 ha. waterfront park is approaching its completion this fall. Xinhua Waterfront Park is a subproject of Huangpu Waterfront Revitalization Masterplan begun by the Shanghai Municipal Government. It is also a key development of the Shanghai Shenjiang Liang’an Development Construction Investment Group. Under one of the five riverside themes of the masterplan, Xinhua Waterfront Park is situated in the cultural corridor section with a total area of 17 ha. The park is located east of historic Minsheng Port at the Huangpu River and west of the waterfront shipyard, connecting important city streets like Minsheng Road, Taolin Road, Yuanshen Road and Fushan Road. It is one of the key projects of Pujiang Cultural Highlands, anticipated to maximize the cultural and leisure experience for users. 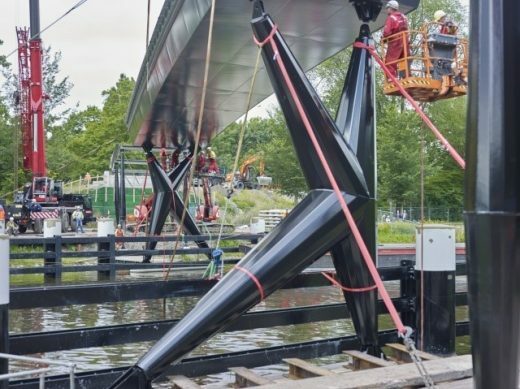 In the second week of July 2017 a floating crane lifted a 34 meter long bridge section into place across the Noordhollandsch Kanaal. West 8’s new bridge with a total length of 150 metres is the first of two bridges to connect the Volewijkspark with the Florapark, combining both into one Noorderpark. It also provides for a direct bicycle connection between the Vliegenbos and the Noorderparkbad, thus linking the eastern and western parts of Amsterdam Noord. The 71 ton deck was raised by four cables and lowered onto two posts that support the bridge. These bearers have already been nicknamed the ballet dancers, because of their ornate form. The bridge will be ready for use next month, while in the meantime residents are given the chance to make suggestions to name this new bridge. The three best suggestions will be announced at the official opening at the Noorderpark Festival in September. After that, a committee of the municipality will make the final decision. In August the final detailing works and soft landscaping in this area will be completed. West 8 designed the Den Helder station area as a gateway to the maritime city of Den Helder. 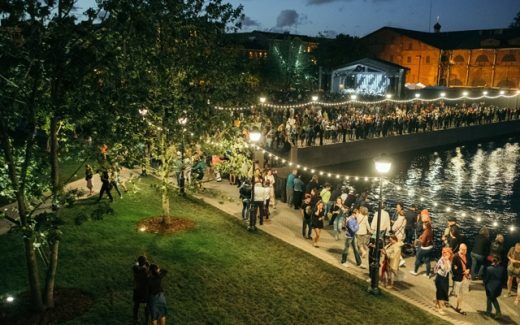 Once a busy transit route, the area has been transformed into a destination with a clear identity that warmly invites new visitors and truly welcomes residents home at the end of a business day. This entrance plaza is a first encounter with the maritime character of the city, intricately reminiscent of the sea, the wind, the beach, the fishing, the shipbuilding and the navy. With its green and inviting character, the area provides plenty of space for cyclists and pedestrians. Motorized vehicles are treated as guests rather than main users. The overall atmosphere is pleasant, and the site borrows attractive views of the city center. As over one hundred newly planted trees mature, they will provide more shade on sunny days and shelter on windy days. The far ends of the brick walls that surround the lawns are fitted with stone artwork with a nautical theme. Stylistically, they refer to the Amsterdam School-style. The walkways from the station square are seamlessly connected to both Den Helder’s main shopping streets and the central city park. In the future, this green ribbon will guide pedestrians all the way to the sea. 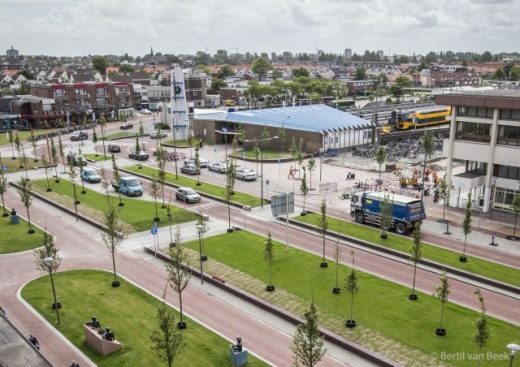 Den Helder’s station area was officially opened on Friday, June 16, by municipal councilman Lolke Kuipers and children of two local primary school classes. Longwood Gardens’ Main Fountain Garden officially had its grand reopening this Saturday May 27, 2017. The fountain has undergone a complete reconstruction, its first revitalization since it was first built in 1931. Two years and ninety million dollars later, the fountain has been restored to its original glory with the technology of the 21st century. 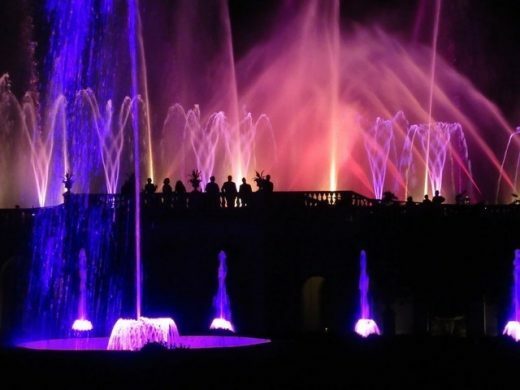 For the premier weekend, the Main Fountain Garden will be open Saturday and Sunday from 9 AM to 10 PM for ticket holders of the fountain show which will be part of Longwood’s “Summer of Spectacle” series. In addition to daily fountains shows, guests will enjoy tours, concerts, and special events throughout the summer. The gardens will have extended visiting hours on Thursdays, Fridays, and Saturdays for evening illuminated Fountain Shows. In addition, the popular Fireworks & Fountains shows, featuring illuminated fountains and fireworks choreographed to music, will return with six exciting special shows–the first on this Sunday, May 28. The crown jewel of the most significant fountain collection in North America, Longwood’s Main Fountain Garden rivals the magnificent fountains of Europe with its beauty and ingenious application of leading-edge technologies and design. The Main Fountain Garden is a hallmark of the Longwood experience visited by more than 1.35 million people each year. As Longwood embarked on preserving the Garden, the team looked to the future to honor Pierre S. Dupont’s vision and ensure the continued enjoyment of the fountains with an original concept of “adaptive restoration” guiding thousands of design, restoration, and technology application decisions. On 25th November 2016, the updated Yongsan Park Masterplan, titled ‘Yongsan Park, Healing and Recovery of the Heart of Seoul’, was presented to the public and media, at the auditorium of the National Museum. Panels illustrating the scenery of the envisioned park, and a 3.5 meter by 5 meter scaled model of the future Yongsan Park, were shown to the Minister, the Yongsan Park Committee, and to numerous members of the Korean Press. General public, local experts, scholars and stakeholders attended the meeting with much enthusiasm. Together with Mr. Kim Kyung-Hwan, vice minister for Ministry of Land, Infrastructure and Transport, West 8’s Adriaan Geuze and IROJE’s Seung Hyo Sang participated in a subsequent podium discussion and explained how they would join forces with local citizens and community groups, to work towards achieving the goal of preserving this culturally, historically and ecologically unique park, with the ultimate aim for it to become Seou City’s future cultural landmark. 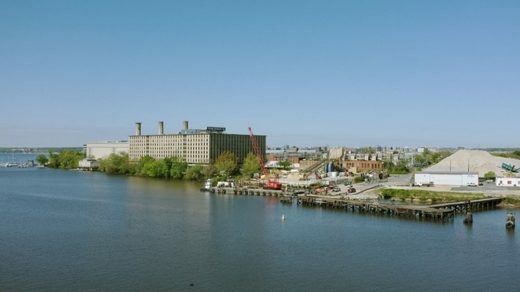 In accordance with the original plan, the US army will withdraw from the site in 2017, which will result in 1200 existing buildings being vacated. In consultation with local heritage experts, these buildings will be assessed for their historical and cultural value. The general public in particular, is encouraged to participate in the planning process and is encouraged to participate in site visits and public presentations. The aim is to collect a diverse range of opinions and ideas and a cooperative design panel, consisting of Korean citizens and the Seoul City Government will be formed in 2017 to help guide important programing decisions for the future Yongsan Park. Officials of the Ministry of Land, Infrastructure and Transport commented: “It is very important to listen to the opinions of our citizens whilst assessing valuable buildings, and to their ideas for the re-programming and future use of these buildings. We will take their comments into account, which is a huge and very important task.” The idea is to remain flexible in the planning. A genuine reflection of the culture, ecology and history of the site shall remain the compass for the future design panel. As four years have passed since the international design competition was held, there were also questions about the difference between the current update and the initial winning proposal. Architect Seung Hyo Sang said “it has been necessary to adjust the plan to reflect the Korea-U.S. agreement, which has resulted in a realignment of the site boundary. “Parts of the park have been redesigned to retain the original design principle” he said. “Such alterations are necessary to achieve a complete city park; a national park”. The current site of Yongsan Park is a walled, prohibited area in the heart of Seoul, and is completely cut off from the surrounding city. How to incorporate the park into the urban fabric of Seoul City is yet another significant task for the design team. “Although it is located in the centre of Seoul, it appears as an isolated forbidden land. 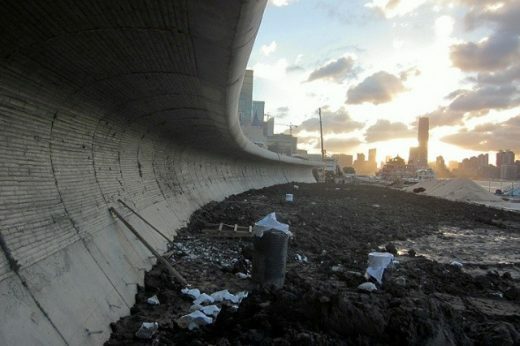 The edges of the future park shall resemble and respond to the surrounding urban context,” architect Seung Hyo Sang said. 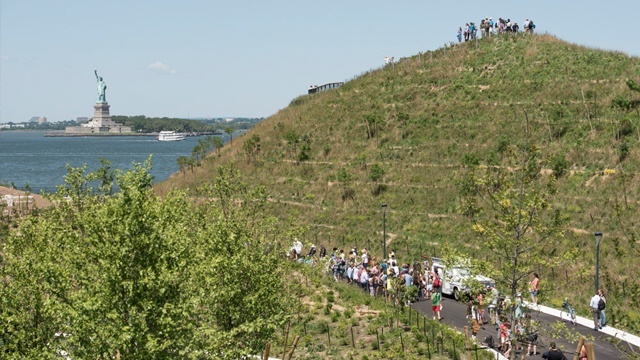 Adriaan Geuze, “We are investigating how the park can be linked with its surroundings, and we hope in this design that the park will be anchored into the city,” he said. 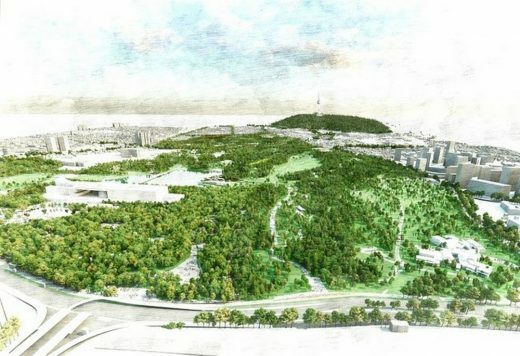 The essence of the design is the restoration and dramatization of the original topographic ridgeline connecting Yongsan Park northward to Namsan, and beyond to the distant Buk-ak Mountain. This conceptually ties the park into the continuous North-South ridgeline that defines the landscape of the Korean peninsula – the “Baek-du-dae-gan.” Along this newly established topography, West 8 has created diverse biotopes that give illusions of the many beautiful landscape types that make up Korea. From open meadows to deep forests, from rocky cascades to cleansing wetlands, Yongsan Park provides visitors with an ever-changing landscape experience for all seasons. Adriaan Geuze, “South Korea has a long history dating back from ancient Korea, we see it from its food culture, in the spirit of people, in poetry, its art, all these cultural assets are accumulated and reflected in the most cosmopolitan and modern part of today’s Seoul” and “to create a park where various concepts and values can come together, an extensive variety of activities beyond the cultural and philosophical history should all co-exist here within one space. It is a very complex task, but it is our mission to accomplish it” he said. West 8 are a Landscape architect studio set up in 1987 in Holland. Their head office is in Rotterdam, with West 8 Brussel urban design & landscape architecture bvba based in Opwijk, Belgium. There is also West 8 New York and West 8 Toronto.